Supermicro and Nexenta storage solutions are a series of optimized reference architectures (RA) based on Supermicro’s industry leading server hardware and NexentaStor, an Open Source-driven Software Defined Storage platform. Supermicro and Nexenta storage solutions allow enterprise IT departments to transform their storage infrastructure, increase flexibility and agility, simplify management and dramatically reduce costs without compromising availability, reliability, or functionality. Running on world class server hardware, Supermicro and Nexenta storage solutions deliver unified file and block storage services, and extremely powerful data protection capabilities. Supermciro-Nexenta storage solutions are highly available and can scale from tens of terabytes to petabytes in a single set. 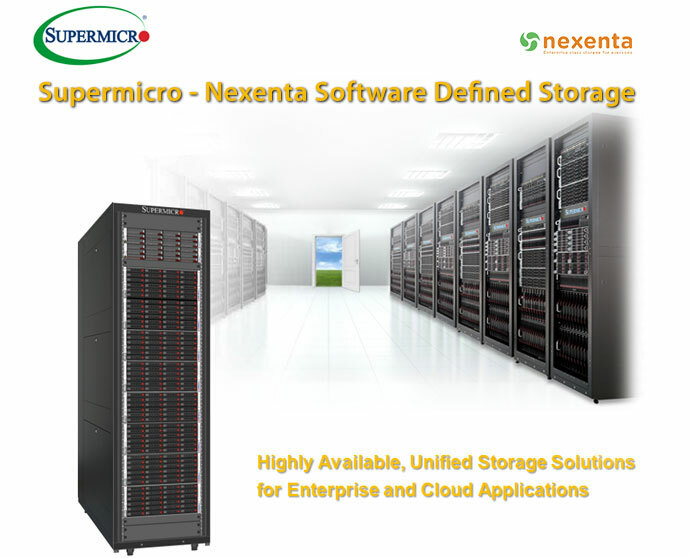 Supermicro and Nexenta storage solutions are ideally suited to support demanding enterprise applications in physical or virtual infrastructure, virtual desktop infrastructure, high performance digital media applications, and large-scale archive repositories. 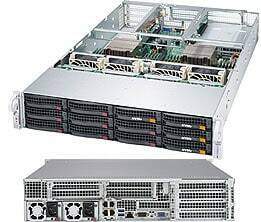 Supermicro and Nexenta X10 Reference Architectures are based on the powerful Supermicro 2U Ultra server as the head node and the high density dual channel SAS3 JBODs as storage shelves. 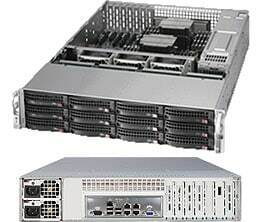 Supermicro 2U Ultra server platforms are designed for extreme performance, capacity and expandability. With superb chassis and thermal design, Ultra can support the highest Xeon processors (160W TDP), extremely large memory (1.5TB maximum) and can handle multiple (8x PCI-E slots) SAS HBAs, 10G NIC and FC adapters with ease. Ultra is also built with Titanium level (96%) power supplies with maximum power efficiency. High storage capacities are achieved by applying single or multiple high density SAS3 JBODs with dual channel expander backplanes. Storage JBODs range from 2U 24x 2.5″ Bay to 4U 44x 3.5″ Bay and 4U 90x 3.5″ Bay. Reference Designs are created based on extensive engineering testing and validation to define the optimal configurations that cover a variety of usage cases. Leveraging ZFS hybrid storage pools and other value-added enhancements, Supermicro and Nexenta storage solutions are Flash-ready. Write-intensive SSDs are used as the ZFS intent-log to reduce write latency. Read-intensive SSDs are used as a cache to reduce read latency and improve performance. The hybrid Flash system was designed to achieve the best balance of cost and performance for any given workload. Supermicro and Nexenta storage solutions are Software-Defined Storage with SMARTS: Security, Manageability, Availability, Reliability, (lower) TCO, and Scalability. These enterprise features are achieved by dual active/active controller (HA) design together with redundant cooling and power, completely eliminating single points of failure. With in-line data de-duplication and compression, thin provisioning, data replication and unlimited snapshots, Supermicro and Nexenta storage solutions can meet the requirements of the most demanding enterprise IT environments. Built-in with Virtual Machine Data Center(VMDC), Supermicro and Nexenta storage solutions support all major virtualized infrastructures – including Microsoft Hyper-V, VMware vSphere & Citrix Xen Server. VMDC dramatically simplifies the VM management with many features such as ZFS snapshots, VM Cloning/Templating and Native VMotion capability, etc.